A multi-dimensional tool, Building Information Modelling (BIM) involves generating a visual model of the building which also manages data about it, at the design stage, throughout the construction phase and during its working life. Typically BIM uses real-time, dynamic building modelling software working in 3D, 4D (workflow) and, increasingly, 5D (quantity surveying) to increase productivity and efficiency, save costs in the design and construction stages, and to reduce running costs, after construction. Building Information Modelling (BIM) covers geometry, spatial relationships, light analysis, geographic information, quantities and properties of building components, project management and post-construction facilities management. BIM data can be used to illustrate the entire building life-cycle, from cradle to cradle, from inception and design to demolition and materials reuse; quantities and properties of materials, which can be easily extracted from the model; and the scope of works, including management of project targets and facilities management throughout the building’s life. Furthermore, systems, components, assemblies and sequences can be shown in relative scale to each other and, in turn, relative to the entire project. Is the buildingSMART IFC file format capable of supporting the creation of COBie datasets? For further discussion on the introduction of new legal and contractual documents that will underpin the adoption of BIM in UK projects, read The CIC BIM protocol – a critical analysis. On a technical level Industry Foundation Classes (IFC or ifcXML) is an open specification for Building Information Modelling; they are effectively an object-based file format tied to a specific data model. IFC was originally developed by buildingSMART to facilitate interoperability in the architecture, engineering and construction industries, and forms a commonly used collaboration format in BIM projects. The IFC model specification is an open and available online (see Further information). The IFC format is registered by the International Standards Organisation (ISO 16739:2013). A more in-depth view of the technical aspects of Building Information Modelling, can be accessed through BIM and building properties. 4D scheduling in BIM allows the designer/manager to see problems scheduled in the works durations and analyse congestion and accessibility more effectively than through standard Gantt charts. A more powerful aspect of 4D schedules are that, unlike a static building model, they are in a dynamic state. By linking time to structural components, it is possible to carry out time related structural analysis using the actual BIM model. If workflow analysis of the model is carried out at design stage, it may determine the preferred material and the construction methodology in order to save time and money. A hard clash is simply when two objects occupy the same space. For example, a pipe going through a wall where there is no opening. Soft clashes refer to allowable tolerances or space; for example, buffer zones between components left to provide space for future maintenance. 4D/Workflow clashes refer to clashes in scheduling work crews, equipment/material fabrication delivery clashes and other timeline issues. The level of BIM utilised is often down to the maturity level of the team and that of its respective parts, so utilising fully integrated 4D and 5D is still uncommon, mainly down to software costs and educational/training limitations. However, the certainty of quantities generated from the BIM model allows several different assessments in finding the most effective solutions prior to construction – BIM modelling means that a schedule of quantities can be produced instantly; whereas previously a QS could spend considerable time measuring and taking quantities from 2D drawings. However, despite BIM’s accuracy, there remains the issue of differences in ‘standard methods of measurement’. The UK uses several SMMs, Ireland mainly uses a version of ARM (Agreed Rules of Measurement), and the US and Australia use other variants. So, a common international standard method of measurement, compatible with all BIM software, seems to still be a way off. Classification in BIM and the differences in standard methods of measurement is discussed in greater detail in Coordinating common arrangement, Uniclass, NBS and rules of measurement. Managing a construction project and building lifecycle using a building information model can result in substantial savings, in both time and money, from design and construction through to on-going maintenance. The model saves time and waste on site, and renders extra coordination checks largely unnecessary; the information generated from the model leads to fewer errors on site, caused by inaccurate and uncoordinated information. When all members of the construction team work on the same model, from early design through to completion, introduced changes are automatically coordinated through the BIM, across the whole project, and information generated is therefore of high quality. Better buildings throughout their life-cycle. Information technology is an integral part of today’s commerce, and transferring design/construction information from designers to producers/constructors is an example where, with the availability of modelling software, the tools are already in place. However, when choosing which simulation tool to use for a project, the teams involved must consider the application’s accuracy, reliability, user base and possible needs for training, considered against the project information they will have at their disposal. Construction is the world’s most wasteful industry; it is the largest consumer of global resources, raw materials and global energy supplies; it creates the largest amount of global solid waste; and it is responsible for around 50% of greenhouse gas emissions. However, it is worth trillions of dollars per annum globally. BIM technology presents a great opportunity for manufacturers, but they must ensure that they keep up and are part of the industry changes, not a future ‘Kodak’. It should be borne in mind that adoption of BIM in the UK is not a mandatory undertaking, yet. However, the Government aims for all publically funded works begun after 2015 to be carried out through a building information model; it is anticipated that where the government goes, regulation and the rest of the construction industry will follow. And, because the public purse funds so much of the building work in the UK, within a very short time, what is currently voluntary is very likely to be mandatory. The article The buildingSMART Data Dictionary offers a brief introduction to what the dictionary project is all about. As leading providers of information to the UK construction industry, NBS offers a range of software tools and information resources that support the design team across the project timeline, enabling the production of co-ordinated digital information. NBS are investing heavily in turning specification and product information into digital objects in anticipation of the industry-wide adoption of BIM. As part of this NBS aims to regularly publish guidance and information on BIM resources for the construction industry. The NBS National BIM Library, NBS Plug-ins and NBS Create will aid information flow throughout the BIM process, enabling more efficient and accurate working when generating design documentation. Even from the project concept stage, objects can be selected from the NBS National BIM Library and added directly to design models; and, due to the direct linkage between design and specification through NBS Plug-ins, access to expert guidance is maintained within NBS Create. By using the plug-in, an outline specification can be automatically produced from the design model. Both specification and model are synchronised, making it possible to manage links to the specification throughout the project. As the design evolves, proprietary objects can be substituted from NBS National BIM Library, while developing the specification detail within NBS Create, providing real-time information on cost and performance. BIM and data modelling techniques offer the opportunity to create specifications differently, meaning a big change in the process. This is outlined in What does Building Information Modelling (BIM) mean for specifications? A digital model is built using lots of small digital components, called BIM objects. These objects are the building blocks of all digital models. However, in the case of BIM, the objects are not about imitating catalogue products; they are digital replications of products and are assembled in the information model. There is currently a huge demand from designers for manufacturers’ BIM objects, but creating and maintaining them requires expertise that architects and designers don’t have time to commit. Furthermore, there’s no efficiency for UK construction if every designer creates their own BIM objects for each manufacturer. This is where the NBS National BIM Library comes in. NBS National BIM Library offers manufacturers detailed usage analysis to help win business. NBS National BIM Library maintains a focus on high quality digitised objects, available on all platforms. As BIM unfolds and becomes the de-facto source of design information for the industry, quality and ubiquity of data objects will separate success from also ran. Simply put, if your object is not available as a digital object, then your product is unlikely to be bought. BIM objects are much more than just graphical representations and using them as placeholder to connect to wider sources of information provides a powerful design tool. A picture paints a thousand words, but never underestimate the power of text investigates linking NBS National BIM Library objects to NBS Create. The future of architecture and the construction industry is digital; of this there can be no doubt, and BIM is the future of design and long term facility management; it is government led and technology driven; and it is implementing change across all industries, but there is still much confusion about what exactly it is and how it should be utilised and implemented. BIM is a digital model which helps everyone understand the building; however, it is a new technology in an industry typically slow to adopt change. Rest assured though, BIM will grow to play a crucial future role in building design and documentation. BIM provides the potential for a virtual information model to be handed from Design Team (architects, surveyors, consulting engineers, and others) to Contractor and Subcontractors and then to the Owner, each adding their own additional discipline-specific knowledge and tracking of changes to the single model. The result greatly reduces information losses in transfer; makes buildings work, and helps build better value constructions. By signalling conflict detection BIM prevents errors creeping in at the various stages of development/construction, because the model actually informs the team about parts of the design which are in conflict or clashing. Finally BIM offers detailed computer visualization of each part and assembly in relation to the total building. As hardware, software and cloud applications herald greater capability to handle increasing amounts of raw data and information, use of BIM will become even more pronounced than it is in current projects. This article was produced with the technical assistance of Ian Chapman and Stefan Mordue, both of NBS. Michael Smith is a member of the Construction Information Service editorial team. He is a mechanical engineering and building services specialist, chartered information specialist (MCLIP) and chartered environmentalist (CEnv). Promoting collaborative working within the construction industry. Official source of all information about the technical specifications issued by buildingSMART International and of the supporting interoperability implementation programmes. ” The construction industry is in the middle of a growing crisis worldwide. With 40% of the world’s raw materials being consumed by buildings, the industry is a key player in global economics and politics. And, since facilities consume 40% of the world’s energy and 65.2% of total U.S. electrical consumption, the construction industry is a key player in energy conservation, too! With facilities contributing 40% of the carbon emissions to the atmosphere and 20% of material waste to landfills, the industry is a key player in the environmental equation. Clearly, the construction industry has a responsibility to use the earth’s resources as efficiently as possible. Construction spending in the United States is estimated to be $1.288 trillion for 2008. The Construction Industry Institute estimates there is up to 57% non-value added effort or waste in our current business models. This means the industry may waste over $600 billion each year. There is an urgent need for construction industry stakeholders to maximize the portion of services that add value in end-products and to reduce waste. Another looming national crisis is the inability to provide enough qualified engineers. Some estimate the United States will be short a million engineers by the year 2020. In 2007, the United States was no longer the world’s largest consumer, a condition that will force United States industry to be more competitive in attracting talented professionals. The United States construction industry must take immediate action to become more competitive. The current approach to industry transformation is largely focused in efforts to optimize design and construction phase activities. While there is much to do in those phases, a lifecycle view is required. When sustainability is not adequately incorporated, the waste associated with current design, engineering, and construction practices grows throughout the rest of the facility’s lifecycle. Products with a short life add to performance failures, waste, recycling costs, energy consumption, and environmental damage. Through cascading effects, these problems negatively affect the economy and national security due to dependence on foreign petroleum, a negative balance of trade, and environmental degradation. To halt current decline and reverse existing effects, the industry has a responsibility to take immediate action. While only a very small portion of facility lifecycle costs occur during design and construction, those are the phases where our decisions have the greatest impact. 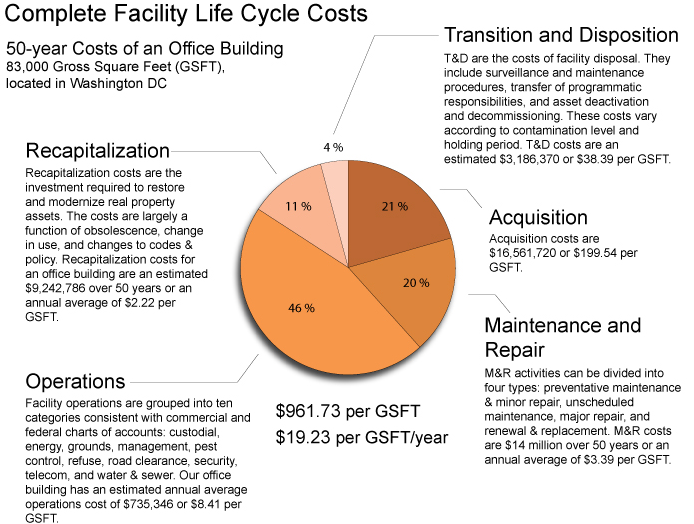 Most of the costs associated with a facility throughout its lifecycle accrue during a facility’s operations and sustainment. Carnegie-Mellon University research has indicated that an improvement of just 3.8% in productivity in the functions that occur in a building would totally pay for the facility’s design, construction, operations and sustainment, through increased efficiency. Therefore, as industryfocuses on creating, maintaining, and operating facilities more efficiently, simultaneous action is required to ensure that people and processes supported by facilities are optimized. BIM stands for new concepts and practices that are so greatly improved by innovative information technologies and business structures that they will dramatically reduce the multiple forms of waste and inefficiency in the building industry. 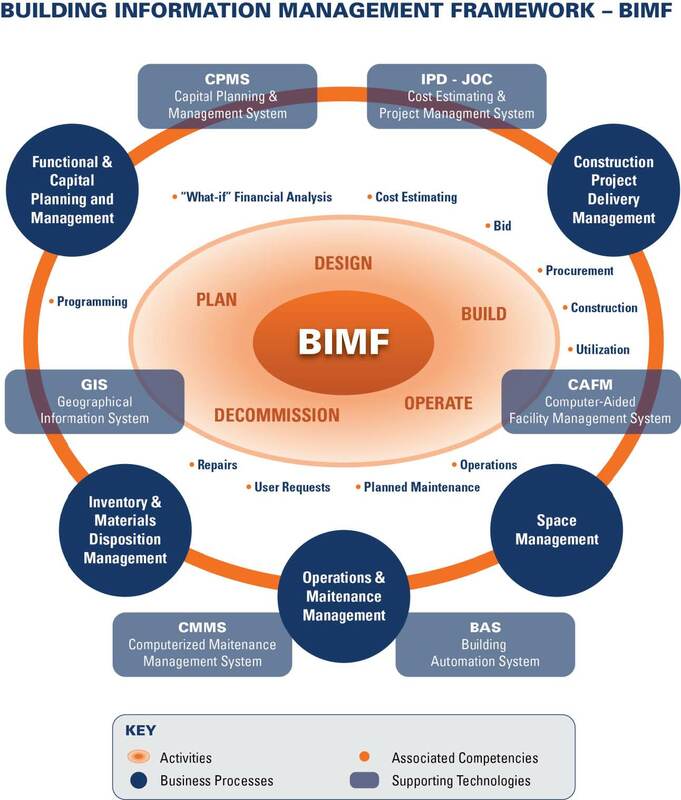 Whether used to refer to a product – Building Information Model (a structured dataset describing a building), an activity – Building Information Modeling (the act of creating a Building Information Model), or a system – Building Information Management (business structures of work and communication that increase quality and efficiency), BIM is a critical element in reducing industry waste, adding value to industry products, decreasing environmental damage, and increasing the functional performance of occupants. .Information Model Standard™ (NBIMS) is a key element to building industry transformation. NBIMS establishes standard definitions for building information exchanges to support critical business contexts using standard semantics and ontologies. Implemented in software, the Standard will form the basis for the accurate and efficient communication and commerce that are needed by the building industry and essential to industry transformations. Among other benefits, the Standard will help all participants in facilities-related processes achieve more reliable outcomes from commercial agreements. Thus, there is a critical need to increase the efficiency of the construction process. Today’s inefficiency is a primary cause of non-value added effort, such as re-typing (often with a new set of errors) information at each phase or among participants during the lifecycle of a facility or failing to provide full and accurate information from designer to constructor. With the implementation of this Standard, information interoperability and reliability will improve significantly. Standard development has already begun and implementable results will be available soon. BIM development, education, implementation, adoption, and understanding are intended to form a continuous process ingrained evermore into the industry. Success, in the form of a new paradigm for the building construction industry, will require that individuals and organizations step up to contribute to and participate in creating and implementing a commonBIM standard. via www.4Clicks.com – Premier cost estimating and project, contract, and document management software fore efficient construction delivery – JOC, SABER, IPD, SATOC, IDIQ, MATOC, MACC, POCA, BOA. Both…. BIM is a digital technology and a business process for life-cycle facility management, from concept thru disposal. The below figure represents components of a BIM strategy. 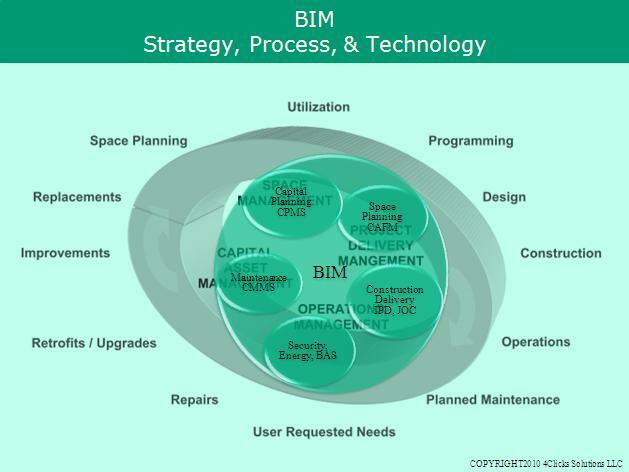 A basic premise of BIM is collaboration by different stakeholders at different phases of the life cycle of a facility to insert, extract, update or modify information in the BIM to support and reflect the roles of that stakeholder. the requirements for exchange must be capable of defining in contract language. 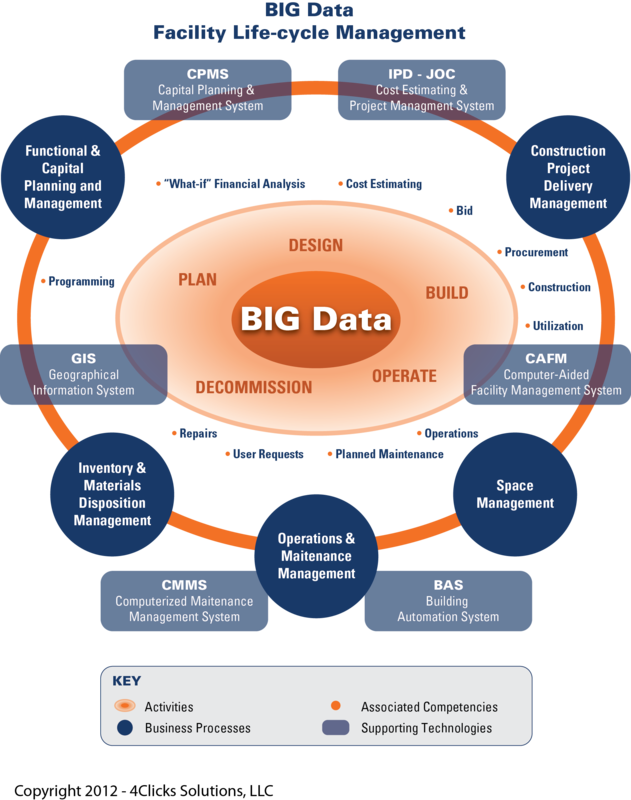 Applied to a project, BIM represents Information management—data contributed to and shared by all project participants. The right information to the right person at the right time. To project participants, BIM represents an interoperable process for project delivery—defining how individual teams work and how many teams work together to conceive, design, build & operate a facility. NBIM standard will incorporate several elements described later in this document but the focus will be on standardized processes which define “business views” of data needed to accomplish a particular set of functions. Definition of BIM ( Building Information Modeling) – Process, Strategy, and Technology to support life-cycle management of a building / built environment.